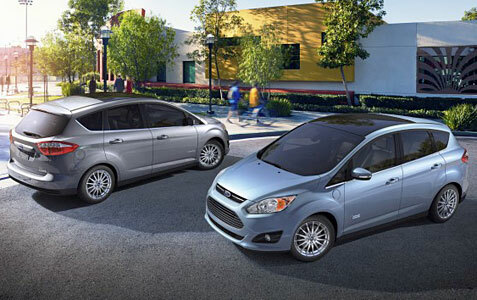 If you are a customer looking to optimize your hybrid car experience, the all-new 2013 Ford C-Max Energi SEL could be the right car for you. This impressive new offering from the Blue Oval has the potential to be another home run in the improving U.S. auto market. Looks aren’t everything in a car, and that holds even truer when one is looking for fuel efficiency. But when a car looks good, there is no better starting point. With the 2013 Ford C -Max Energi SEL, we might have the first true hybrid that can boasts good looks as one of the main selling points. Ford was smart by taking the European Focus C-Max and transforming that car into one of the best cars on the market. Our test model sported 17-inch machined aluminum wheels, fog lamps, power lift gate and keyless entry. The ruby red metallic paint looked incredible on the C -Max Energi SEL, adding just enough bling to a car that is all about making smarts. The C-MAX line also features the company’s innovative hands-free liftgate, which allows quick and easy access to the cargo area without ever needing to fumble for keys. A gentle kicking motion under the rear bumper opens the liftgate when used in combination with a key fob the user keeps in his or her pocket or purse that tells the car it’s okay to engage. The same motion can be used to close the liftgate. C-Max Energi provides customers with plenty of interior versatility and flexibility along with the urban maneuverability of a smaller vehicle. The sight lines in the 2013 Ford C-Max Energi SEL are as good as any car or truck we’ve tested, and that makes us feel like better drivers on the road. The C-Max line features a high roof design that gives each vehicle an overall height of 64 inches along with a higher command-style seat position instead of a cockpit type. It also features five-passenger seating that includes a split, fold-flat second-row seat. In C-Max Energi, there’s 43.4 cubic feet behind the first row and 19.2 cubic feet behind the second row, which we found somewhat limited. Our test model was equipped with ambient lighting, dual zone climate control, in-floor storage in the rear of the car, black leather trimmed seats with a 10-way power driver’s seat, leather-wrapped shift knob and steering wheel, premium audio and navigation package, hands-free technology package, rearview camera and automated parking system. The feel of the cabin materials were what you would expect in a luxury car, and the overall interior space was smart and stylish. Because of the multiple driving options regarding power source, the dashboard was easy to navigate and understand. There is a lot of Escape DNA in the interior of the 2013 Ford C-Max Energi, which adds some styling flair to this very cool ride. The C-Max Energi also features the newest version of SYNC with MyFord Touch to help inform, enlighten, engage and empower drivers with an emphasis on increasing fuel economy. This feature offers multiple ways for customers to manage and control their phone, navigation, entertainment and climate functions through voice commands, menus accessed through controls on the steering wheel, touch screens, buttons or knobs. In C-Max Energi, the system offers additional information such as battery state of charge and distance to the next charge point. The C-Max also offers the next generation of SmartGauge with EcoGuide. Designed to help drivers get the most from the C-Max, information such as instantaneous fuel economy can be displayed on the left cluster to help drivers more closely monitor how their driving behavior affects the vehicle’s efficiency. In the right cluster, redesigned imagery of green leaves shows overall driving efficiency. The left cluster shows Brake Coach, a feature that helps drivers optimize their use of the regenerative braking system so that driving range can be enhanced through proper braking techniques. Available for C-Max Energi is the MyFord Mobile smartphone application that allows users to monitor charging, receive alerts, find charge stations, plan trips and do more from their smartphones or computers for an effortless transition to an electrified vehicle lifestyle. As tested, the C-Max Energi delivered top fuel economy featuring the next generation of Ford’s acclaimed power split technology that allows operation in electric mode at higher speeds than any other hybrid that hits the 500-mile overall driving range, and that’s impressive. C-Max Energi gets her power through the combination of a gasoline engine and a battery-driven electric motor. When powered by gasoline, C- Max Energi uses the all-new 2.0-liter Atkinson-cycle four-cylinder engine which is a powerful and fuel-efficient engine and among the most advanced non-turbocharged four-cylinder powertrains Ford has ever offered. Totally impressive in both power and smoothness, the electric and gas powered powertrain are top of the line and a joy to drive. The electric motors of the C- Max hybrids are powered by advanced lithium-ion (li-ion) battery systems designed to maximize use of common, high-quality components, such as control board hardware that has proven field performance in Ford’s critically acclaimed hybrid vehicles. Li-ion battery packs are more efficient than nickel-metal-hydride (NiMH) batteries. They also are 25 to 30 percent smaller and 50 percent lighter than NiMH batteries used in today’s first-generation hybrid vehicles. C- Max hybrids offer Ford’s next-generation powersplit architecture that allows the electric motor and gasoline-powered engine to work together or separately to maximize efficiency. The engine also can operate independently of vehicle speed, charging the batteries or providing power to the wheels as needed. The motor alone can provide sufficient power to the wheels in low-speed, low-load conditions and work with the engine at higher speeds. C- Max Energi is charged by connecting the vehicle’s external charge port to either a standard 120-volt outlet or available 240-volt charging station which is simple and only necessary if you want electric only driving. The plug-in and hybrid markets are really heating up with new competition rising up quickly, and that is a good thing for consumers. 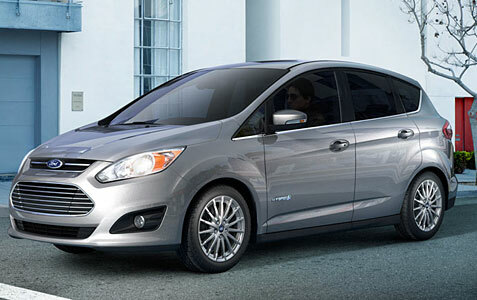 Ford appears to have a big winner on their hands with the plug-in option 2013 Ford C-Max Energi SEL. For those who crave electric only driving, one can plug in the Energi’s battery for 2.5 hours and propel the car for approximately 21 miles on electric power and then switch back to hybrid driving. The design, first-class interior and fun-to-drive powertrain of the 2013 Ford C-Max Energi SEL will put many rivals back to the drawing boards for an answer. Our SEL model was loaded and came in with a price tag of $38,415, which is very competitive when considering the plethora of options as tested. With so many automakers trying to cut weight from their vehicles, it’s really surprising how strong and durable the 2013 Ford C-Max Energi SEL felt on the road while delivering eye popping fuel efficiency. Ford is on to something special with this one!